In cells from all organisms studied to date two different types of RNA molecules are found: messenger RNAs (mRNAs), which are translated into proteins, and so-called “non-protein-coding RNAs” (ncRNAs), which are not translated into proteins but function at the level of the RNA itself. Many known ncRNAs, such as microRNAs, are involved in the regulation of gene expression and thus act as genetic switches. While the proteome of most model organisms is rather well-defined, i.e. the total number of protein-coding genes, we are only at the beginning of describing the ncRNA transcriptome. Thus, the predictions on the number of ncRNA genes in the human genome range from about 1.000 up to 450.000 (estimated from tiling-array experiments); in comparison, only about 20.000 protein-coding genes have been identified in the human genome. NcRNAs are often found in complex with proteins that are bound to the ncRNA and thus form ribonucleo-protein complexes (RNPs). Such RNPs, present in cellular compartments as diverse as the nucleolus or dendritic processes of nerve cells, exhibit a surprisingly diverse range of functions. However, the biological roles of most of them remains elusive. Moreover, most systematic genomic searches are biased against their detection and comprehensive identification by computational analysis of the genomic sequence of any organism remains an unsolved problem. Therefore, our goal is to directly identify ncRNAs and their genes in the human genome and those of various model organisms as well as to elucidate their functions in cellular processes and human diseases. 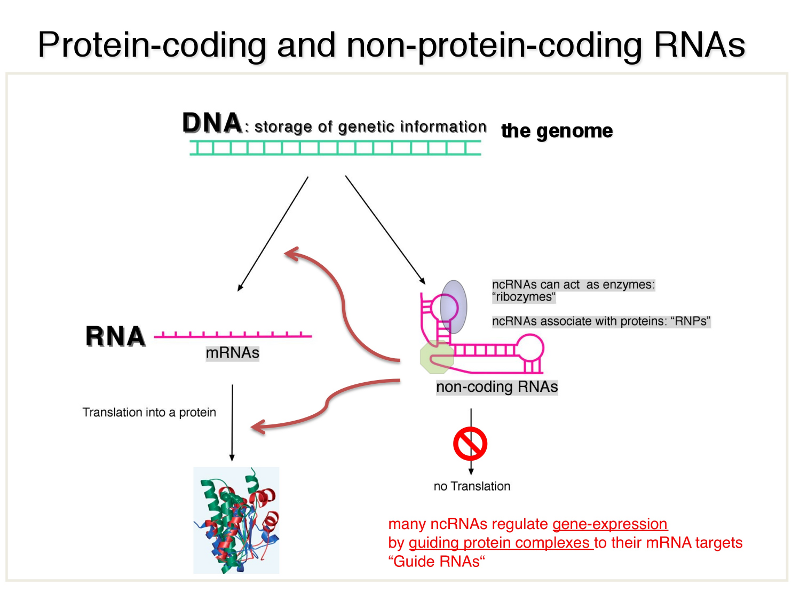 Figure: Two classes of RNA species are transcribed from genomes of all organisms: messenger RNAs (mRNAs) and non-coding RNAs (ncRNAs); ncRNAs are not translated into proteins and many of them are able to regulate gene-expression by regulating transcription or translation of mRNAs and thus act a genetic switches.